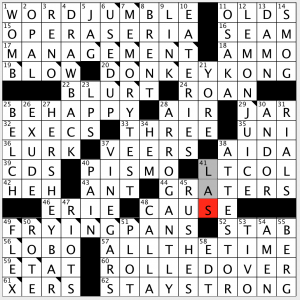 A bit easier than the Friday NYT, for me, even though I needed to work the crossings to figure out 1-Across. [Certain fish … or sailboats]? Those are SKIPJACKS? Alrighty then. Among the better entries, we have LAY SIEGE TO, FORETASTE (which really is not the opposite of aftertaste, but should be), DATA MINERS (I guess … is that what people engaged in data mining are called? ), ACT OF LOVE (boy oh boy, right beside RAT POISON—don’t trust your lover? ), and AQUA ZUMBA. Did not know: 40d. [Mariah Carey holiday song that was a #1 Adult Contemporary hit], OH SANTA. “All I Want for Christmas Is You” is much better known but doesn’t fit into 7 squares). Also didn’t know: 8d. [Lead female role in “Singin’ in the Rain”], KATHY. 23a. [Urban open space], CITY PLAZA. I tried CITY PARKS here, as “open space” can be one area or a bunch of areas. “City plaza” is not a familiar phrase to me. 20d. [Rigby of songdom], ELEANOR. You want to listen to the song (if you’re not deaf), don’t you? See below. Wasn’t in love with the fill overall, but there’s nothing so grievous in it. (Boo on cluing ADDER, a perfectly respectable snake, as a roll-your-own word instead, with [Summer] meaning “one who calculates sums” even though nobody would use that.) 3.75 stars from me. Movie titles are given a G-rating, i.e. they have a G added to the start of certain keywords. 32a [Pink uniform color adopted by a historically black university?] GRAMBLING ROSE. Rambling… (1991, Robert Duvall, Laura Dern.) Nice one. 45a [Bitterness over Christmas preparations?] GALL ABOUT EVE. All… (1950, Bette Davis.) Hmm. How about [God’s shock during the Forbidden Fruit incident?]? 65a [Yield from a plum-wheat hybrid?] PURPLE GRAIN. …Rain. (1984, Prince.) The “plum-wheat hybrid” just confused me. 82a [The NCAA’s Falcons knocked out of March Madness?] AIR FORCE GONE. …One. (1997, Harrison Ford, Gary Oldman.) This one made me chuckle. As if Air Force would ever make it into the tournament. Oops, I stand corrected. They made it in four times going back to 1960 (and lost in their opening matchup each time). 98a [Deep cuts made by Merkel?] ANGELA’S GASHES. …Ashes. (1999, based on the Frank McCourt novel.) Got this one just off the ending -ES. Another good one. 110a [Party in an Empire State Building wedding?] A GROOM WITH A VIEW. …Room… (1985, Helena Bonham Carter, Julian Sands.) How about [Really tall husband-to-be?]? 16d [Toe woe in Togo?] GOUT OF AFRICA. Out… (1985, Streep/Redford.) GOUT OF AFRICA sounds like its more widespread than just Togo (which I had to look up), but I do like the rhymes in the clue. 58d [Bit of winter wear that stretches forever?] ENDLESS GLOVE. …Love. (1981, Brooke Shields.) I did not remember this was a movie; I only know the Ross / Ritchie song. Also, the clue lacks surface sense to me. There are a lot of options that could have been funnier (though I admit they might not have fit): GLOVE, ACTUALLY; CRAZY, STUPID GLOVE; SHAKESPEARE IN GLOVE. I like the consistency of focusing on film titles, given the title of the puzzle. I got a couple chuckles here and there, but mostly I didn’t get the thrill. Good fill: HIGH-RISE, REDEEMER, OLD SPICE, REDDING, SHARONA, DIAL-UP, ROOT BEER, EXACTA. Not-so-good fill: LOTS OF, RIVES, ANTI-SAG crossing TATIS, ARB, and really ucky partial OH TO BE. Also, quite a few RE- words: RE-ARM, REPOS, RE-TEAM, RE-RIGS (REDEEMER gets a pass), and AT phrases: AT A CRAWL, AT A TROT, and AT WAR. New to me: VALENTI [Longtime Motion Picture Association of America president Jack], the aforementioned TATIS [Fernando who got two grand slams in a single inning in 1999] (though that is a remarkable stat! 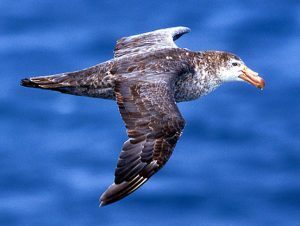 ), and PETREL [Far-flying seabird]. Oh, and LA PLATA [Port southeast of Buenos Aires]. At first I had LAPLACE, but then I realized I was thinking of the mathematical “Laplace Transform” guy. I momentarily tried to stretch out LA PAZ to get it to fit, but obviously that didn’t work. Hit and miss for me today. The theme is consistent and solidly executed, but I didn’t feel a sparkle. And much of the fill was noticeably troublesome. 3.2 stars. I was having issues with my Across Lite timer. On my Mac, it doesn’t shut off when the puzzle is done. I turned on the “Switch off timing” toggle, which says it will score on correctness only, but the timer doesn’t start. In watching the Downs-Only streams, the version of Across Lite on there shuts off when they are done. I think. Maybe it doesn’t. Anyway, my time was in the 7-8 minute range, which is about right for a Saturday LAT challenge. This is a great collaboration by the collaborations king Erik Agard and Tracy Bennett. Shoot, before it’s all said and done, I wouldn’t be surprised if you see MY name next to his in a byline! A super-low 66-word puzzle today with awesome fill. I would love to know who did what. Erik is, of course, the reigning ACPT champ, but Tracy is a great constructor in her own right! A solid 4.8 stars for this one! 22A [“__ 281”: film about the making of “Citizen Kane”] RKO – Never heard of this, but if you think about it a minute it makes sense. This, in my opinion, is truly the best movie I have ever seen. On several levels. 34A [Words dismissing the statement that preceded them] “SAID NO ONE EVER!” – This is the best entry in the puzzle, and my theory is they started the construction here. Awesome. 55A [Covert ’50s-’70s federal flier] AIR AMERICA – This page explains what this was, for those of you that don’t know. There was also a Mel Gibson/Robert Downey Jr. movie with the same title about the same thing. 10D [Hockey announcer’s “Great stop!”] “WHAT A SAVE!” – Hockey is arguably the fifth or sixth most popular sport in this country, but their playoffs are unmatched for drama, at least to me. 30D [Capital of Hesse] WIESBADEN – This, for some reason, seemed easy. I have never been here! 41D [Reagan defense secretary Weinberger] CASPAR – I think the ghost spells his name -ER. Thus making this fellow crossword famous, to a degree! I could go on, because there is lots of good stuff in here, but I have to blog three more puzzles this weekend! Understandably, you will see my words again soon! Again, I have Across Lite timer issues, so this time was in the 17-18 minute range. Yes, there are tons of error marks in here, but that’s because I used the check answer feature waaaay too early. Sometimes I don’t have enough patience, especially since I know I have to get these Stumpers done by a certain time! 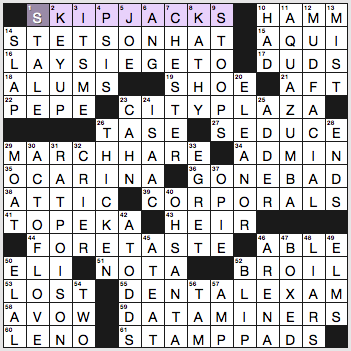 I have seen Greg Johnson’s byline for LAT Saturday themeless puzzles, but I don’t remember his too often for Stumpers. Is this one of his first ones? Or has it just been a while? 72 words in this one, which is about the upper limit for a themeless, but there are tons of great entries in here. I don’t see anything crosswordese-y at all. I’ll take that over 2 or 4 less words. 4.7 stars from me. 15A [“Grande produzione musicale”] OPERA SERIA – This clue translates to “great musical production.” The answer literally means “serious work.” Once you figure out the clue is in Italian, it isn’t too hard. I have never seen an opera. There aren’t many in Indiana to see! 20A [Game with an ’80s heyday] DONKEY KONG – Arguably still a big influence, since I believe Mario and Luigi are originally from this game! 33A [Number for lithium] THREE – Yes, this is element number 3 on the periodic table. For some reason that seemed surprising to me! 40A [ __ Beach, CA (“Clam Capital of the World”)] PISMO – I knew this sounded familiar! 61A [Jay-Z and Dr. Dre, by birth] X-ERS – I thought they both might be LEOS! And you can now see why the error marks are in THAT corner! 8D [General who cowrote “A World Transformed” with George H.W.] BRENT – This is not a difficult entry, but the clue is quite hard. But what other famous “Brent”s are there? Brent Musberger (sportscaster)? Brent Spiner (Date from Star Trek:TNG)? Those arguably, to some people, would be just as hard. 12D [Common sushi ingredient] LEMON JUICE – I did not know this. Let’s learn something new! 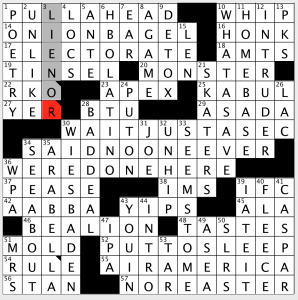 28D [All modesty aside] ARROGANTLY – This clue seems like not quite the right sense for this word. But that may just be me. Haughty is a synonym of arrogant, but arrogant seems to carry more of a sense of entitlement. Funny how we perceive words, which is why language is so fascinating. 38D [Notary, for instance] ATTESTOR – I need to get a notary stamp here soon. Then I, too, will be an ATTESTOR! I hope everyone has fun at Lollapuzzoola today! My home version puzzles are coming sometime tomorrow, hopefully! Wish I could be there! I am actually visiting my dad in Kentucky this weekend, so I will try to monitor Twitter to see who wins! This entry was posted in Daily Puzzles and tagged Erik Agard, Gabriel Stone, Greg Johnson, Mark Diehl, Mike Shenk, Tracy Bennett. Bookmark the permalink. I love The Beatles and Ray Charles but this week Eleanor Rigby belongs to Aretha. Thank you to the person who improved the link! To Mr. Stan Newman or any who know: Is Newsday requiring a subscription for all or is it narrower in scope? ADDER for Summer is to Saturday puzzles as ADDER for Viper is to Monday puzzles and the perfect amalgam of the two as a clue for ADDER is “Calculating snake?” (used on a Tuesday in 1995). Themed themeless and more. Thanks. Greg, I just tried themeless #1, which I liked a lot. Your site’s now added to my bookmarks. Thanks for all these puzzles to enjoy. No prob. More to come soon. I echo Paul; enjoyed Themeless #1 and will be back for more. Greg: Same opinion here for Themeless #1- Niiiiiiice! I take issue with SHOE as a “makeshift fly swatter.” In my experience, a makeshift flyswatter is a rolled-up newspaper, while SHOEs are used for chasing and squashing cockroaches. A shoe is too unwieldy for going after flies. I did a quick study of house flies, once, and was amazed at what I found. They are probably the most vile of all creatures. Maggots can live in an anaerobic state for up to 24 hours! When I worked at a taxidermy we would boil bear skulls in arsenic-laced water for a couple of hours to soften the skin attachments. Scooping out the brains revealed maggots, still alive! Flies have the disgusting habit of spitting on solid foods to liquefy it before sucking it up their straw-like proboscis. They carry a multitude of pathogens on their bodies but it’s their vomit and defecation that are most dangerous to humans. Junk mail made into a fan for me. We can obviously see the athleticism of Usain Bolt when he runs. Sports fans know that boxers can be fabulous athletes, but their athleticism is not always obvious. I have always thought that one of the greatest manifestations of athleticism was muhammad Ali’s ability to catch house flies in the air. He could throw a punch in .06 of a second, three times faster than a blink. Can anyone forget the scene from “Magnificent Seven” when Robert Vaughn’s character is disappointed when he catches only seven flies with one attempt.? Steve, not to rain on Ali’s parade, but it’s really not that difficult to catch flies on the fly. Try it. my recollection of Ali’s hand speed come from a more than 50-year old article in Sports Illustrated. For some reason, I was always mesmerized by Ali–he might have still been Cassius Clay at the time of the article. I had not thought about catching flies again until I read your post today. I am pretty sure I have never caught a fly unless by accident. I was attacked by three bees once. I fended off two and the third one got me. Papa John, I humbly proffer the natural history and habits of hagfish (Myxini). To maximize the luridness of results, I recommend your search include terms such as ‘disgusting’ or ‘repulsive’. Where are the Stumper puzzles available in Across Lite format? 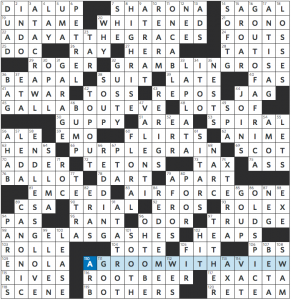 They are in Across Lite format if you have the full Crosswords app and subscribe to it. I solve them often that way. Derek, could you please post a link to the specific Crosswords app you mean? I too would love to have an alternative platform for the Newsday puzzles. Thank you! Really enjoyed the puzzle. Liked in particular, March Hare for “Tea Party member” and Attic for “Story of past glories, maybe”… clever. The clue for NOR’EASTER in today’s L.A. Times opus had this Bostonian laughing out loud. Great work! Stumper: “This is not a difficult entry, but the clue is quite hard.” — This is like the definition of the Stumper!